Rhubarb is popping up in my garden, so this edition of Cooking With Chloe comes from yours truly. 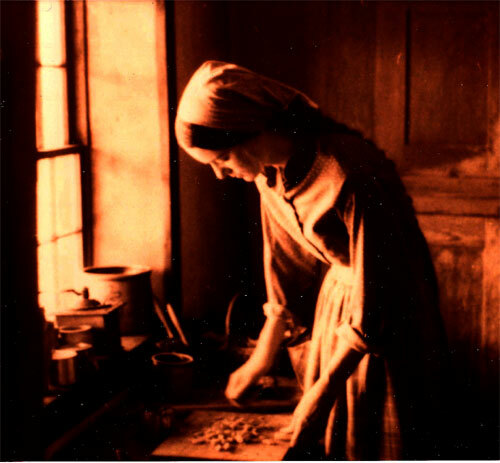 As curator of collections at Old World Wisconsin, Chloe Ellefson, protagonist of my historic sites mysteries series, is responsible for maintaining the antique stoves in each historic kitchen. In Tradition of Deceit Chloe skis to one of the German farms one winter day—for purely professional reasons, of course—and bakes kuchen. At Old World this German coffeecake is often made at the 1875 Schottler farm. The Schottlers’ granddaughter recalled enjoying the treat with her grandparents. You don’t need a wood stove to bake kuchen, and you can use whatever fruit is in season. Put yeast and water and 1 c. flour in mixing bowl. Let sponge set for about 1 hour. Add sugar, salt, nutmeg, shortening, and egg. Add remaining flour and knead. Let rise until almost doubled, 60-90 ninety minutes. Grease a round cake pan or cast iron skillet. Punch down dough, and form dough into pan. Top with sliced fruit, and/or cinnamon and sugar. Bake at 350 degrees until golden brown, about 35-45 minutes.